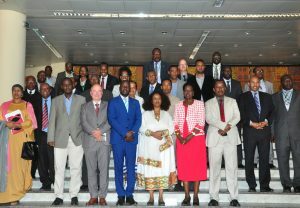 The Horn of Africa Regional Environment Center and Network (HoAREC&N) facilitated launch of HAWEN by IGAD member countries on November 15th 2017, in the ceremony held at African Union headquarters in Addis Ababa, Ethiopia. The HAWEN is a new regional body to expand and strengthen the fight against illegal wildlife trade in the Horn of Africa. Ministers responsible for wildlife conservation from the IGAD member states signed a Protocol and Declaration establishing the Horn of Africa Wildlife Enforcement Network (HAWEN) as a specialized technical body of IGAD. The launch capped a five-year initiative driven by recognition that illegal wildlife trade is a common threat that has no respect for borders and that stronger, more active cross-border cooperation is needed to combat it. As a specialized technical body of IGAD, the HAWEN will lead implementation of wildlife enforcement component of the IGAD Wildlife Management Strategy adopted in July, 2017. This includes coordinating the participating governments on wildlife trafficking and enforcement matters and providing a regional platform for information sharing, promoting uniform enforcement standards, law enforcement cooperation, coordination of capacity building and training, and public outreach. Externally, the HAWEN will act as a focal point for relations with other WENs and partner organizations including the partners in the International Consortium on Combating Wildlife Crime (ICCWC). The HAWEN will also support implementation of the African Strategy on Combating Illegal Exploitation and Illegal Trade in Wild Fauna and Flora in Africa, adopted by the African Union in 2015, within the IGAD region. The HAWEN Secretariat will be located at IGAD headquarters in Djibouti. Key partners supporting the HAWEN include the Horn of Africa Regional Environment Center and Network (HoAREC), the International Fund for Animal Welfare (IFAW), the IUCN National Chapter of the Netherlands, and the Dutch government. The governments of Sweden and the United States of America, the African Wildlife Foundation, Born Free Foundation, Freeland Foundation, TRAFFIC, and the Wildlife Conservation Society have also contributed to the HAWEN initiative. More information about the HAWEN is available at www.hawen.org.